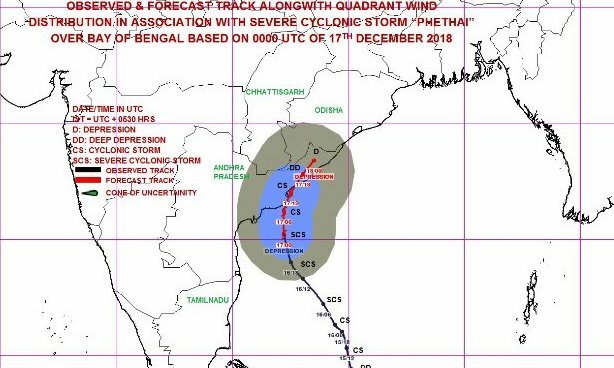 ONI Bureau: Cyclone Phethai has made a landfall near Katrenikona village in East Godavari district of Andhra Pradesh. Heavy rains and winds experienced in many areas in the district. A heavy rainfall warning (Orange warning) has been issued for six districts including Koraput, Nabarangpur, Rayagada, Malkangiri, Kalahandi, Gajapati on December 17. Similarly, isolated heavy rainfall (yellow warning) has been issued for Ganjam, Puri, Kandhamal, Nuapara, Bargarh, Bolangir, Jharsuguda and Sambalpur, Sundargarh and Keonjhar district on December 17. As per report, 11, 600 people of 7 vulnerable blocks in Gajapati district have been shifted to safer places. All districts have circulated the warning among farmers with advice to take care of paddy. Steps were also taken to protect paddy in Mandis. While, all District and Field officials are alert, all districts have been instructed to update the situation and rainfall status from time to time. Farmers have also taken steps to harvest, store and shift the paddy crops to safer places.